The 'Secret War' On Cash! "You are a casualty of the 'war against cash' if you have a bank account – and probably do not even know it," according to author and Swiss America Chairman Craig R. Smith. Governments have always had a love-hate relationship with cash because cash is anonymous money which may represent untaxed earnings. This explains why the fix is now in to outlaw cash and usher in a “cashless society,” according to a radio interview that I just conducted with Mr. Smith. According to Craig, "The federal government, big banks and the tech giants all have plans to digitally end paper money ... forever!" You must hear this confidential interview with Mr. Smith, which is now available on a complimentary CD or mp3. It is vital to understand what steps must be taken to protect your hard-earned money from this accelerating WAR ON CASH. 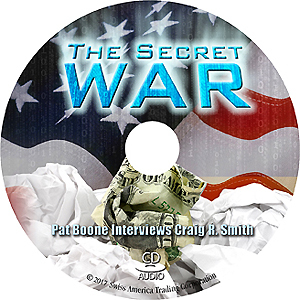 To receive your THE SECRET WAR Audio CD (or mp3) and SPECIAL REPORT now, Call 800-289-2646 or register here.